energy requirement variations in the spring and fall. What is the Energy Density of Sunshine on Earth? Depending on location and season, the "Energy Density" of sunshine on Earth (on a clear day) is about 1,350 watts per square meter. This is fairly low compared to other energy sources. In our first Zero Energy Design® home in 1979, sunshine alone (with no electricity required) made our greenhouse 88O F (for free) when there was snow outside on cold, clear, winter days. The ancient Greek (and Roman) word for this concept was "heliocaminus", which literally means "solar furnace." If you lay a dark-colored garden hose out on a sunny day, the water inside it can get warmer than the 120O F setting on a hot water tank. The rate that water flows through will partially determine the output water temperature. Flat-panel solar hot water heaters (black tubes covered with glass) have an upper temperature limit of around 160 degrees F. With a flat plate solar collector it is easy to heat air or water to 160O F on a clear day, but sunshine alone will not boil water without some type of "solar concentrator" (mirror, lens, conversion to electricity, etc.). To produce higher temperatures (for some applications like industrial cleaning, "absorption chillers", or melting metal), it is necessary to use a solar concentrator. These solar-thermal heating systems can raise temperature well-over 1,000O F. They can be cost-effective in many high-energy-consuming industrial applications. When the desired temperature is more than a few hundred degrees F, a heat-transfer / storage medium other than water is often used (such as certain oils or molten salts). One of the important design issues with solar concentrators is the clarity of the local skies. Intense sunlight from clear skies is easy to concentrate at a focal point. However, sunlight from hazy overcast skies can NOT be focused. That is one of many reasons why Zero Energy Design® wants to build Emerald Eco-City where the skies are clear and dry most of the year. Deserts (that other people think are worthless) with no existing obsolete infrastructure are just want ZED is looking for. Such land should be extremely low cost (until we demonstrate how very valuable it really is to the survival of humanity). It is nice to be able see value in "worthless" things (like a diamond in the rough) before the mediocre majority gets their first clue. Aluminum melts at 1,220O F. Red-hot molten lava rock from a volcano is about 1600-to-2,000O F. High-temperature jet engines only get 2,400O F. High-temperature structural steel melts at 2,900O F (which is required for other industrial foundry applications). An outer-space solar concentrator (in a near-vacuum) has the theoretical temperature limit of the 9,990O F surface temperature of the sun (93 million miles away), but temperatures above 6,300O F on Earth are not practical inside our atmosphere. There is no known material on Earth than can withstand 6,300O F. Concentrated sunshine can melt anything on Earth. You can use concentrated sunshine to melt, refine, cast, and weld any known metal or exotic alloy today. Emerald Eco-City will be able to directly use abundant sunshine for ANY industrial thermal-energy process that we may choose to do in the future. We do NOT need to ever burn anything to melt steel, etc. It is merely a matter of solar-energy collector area, equipment cost, and the concentration ratio (compared to a flat plate solar thermal collector). The energy is clean and free. The average annual temperature above 2000-feet in the dry southwestern areas vary in the mid-50's to 60's degrees F. This means that Emerald Eco-City will need both passive solar winter heating, and passive / active solar cooling in the summer. Our super-insulated earth-sheltered outer shell, and Zero Energy Design® " Thermal Buffer Zone " will greatly reduce our need for interior-air space heating and cooling. In many locations, conventional architecture spends 45%-to-60% of expensive utility bills on space heating and cooling, depending on the climatic zone, and individual comfort control desired. For over thirty years, Zero Energy Design® (in conjunction with the U.S. Department of Energy, et.al.) has been demonstrating how to reduce that requirement by 70%-to-90%. The technology is NOT NEW. It is just not understood by non-learning conventional architects and lazy builders. 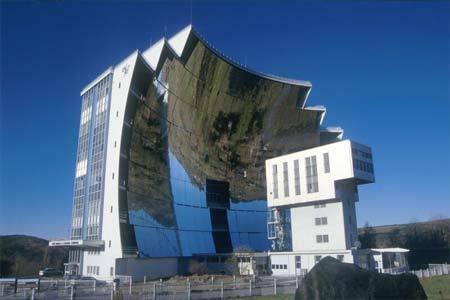 In Spain all new house MUST use solar energy. It is good for their entire more-energy-wise nation. 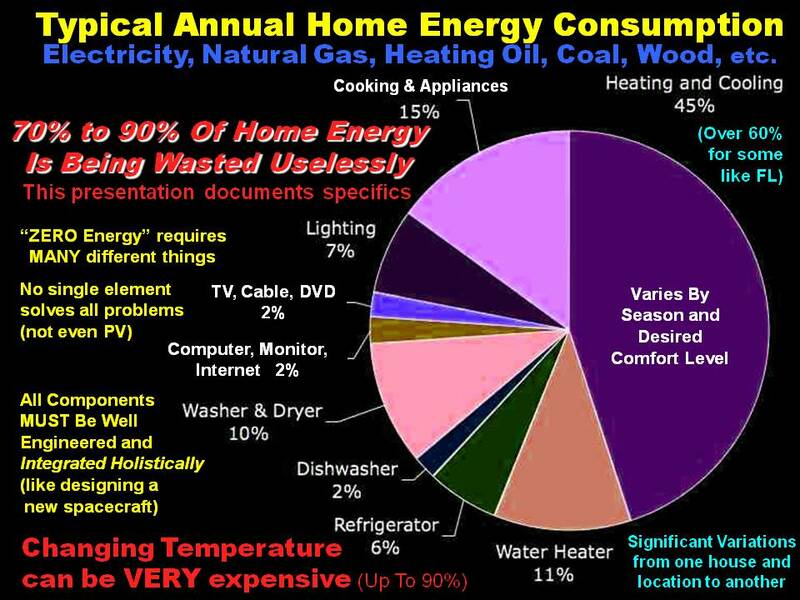 For the most part, CHANGING TEMPERATURE wastes the most-significant-portion of the majority of conventional utility bills (space heating, air conditioning, cooking, hot water, clothes washer, dishwasher, and incandescent lighting). Sunshine can provide all of the solar thermal energy that we need for heating, and 1858-technology solar-powered " absorption chillers " can use sunshine to make things ice cold. Conventional architects have been LAZY and failed to understand and take advantage of modern Building Science and Solar Technology that was proven cost-effective decades ago. All Emerald Eco-City thermal systems will be state-of-the-art holistically integrated and optimized for zero-net energy consumption from external sources. Solar Thermal Energy will be used to generate all of our hot water needs, from swimming pools and hot tubs, to domestic hot water for bathing, washing clothes and dishes, and precise winter space heating control (bathroom floor, etc. Some of our residential units will have Zero Energy Design® "Virtual Fireplaces", which have a video display and sounds of a real fireplace. A thermostatically-controlled "hydronic" heating system will run solar-heated water around the virtual fireplace, to make it feel like a real fireplace. Heat Recovery Systems will be used to extract-and-recycle heat from all warm-water drains, and internal thermal processes. The "Excellent" solar radiation potential near where we build Emerald Eco-City, will allow the most-advanced state-of-the-art industrial applications of solar-thermal energy on Earth. We will invest in research to make efficient use of local solar energy for a great many things.